This is going to get pretty interesting. So with the upcoming release of Batman v. Superman I decided to compile a list of MY favorite films out of the two in each franchise. I literally grew up watching all of these films so a lot of them come from a perspective when there was no internet to tell me how I feel about it and more so from genuine feelings for each one. I hope you guys like this list per the usual and if you have any questions or disputes, then you know what you need to do. 10. Batman & Robin (1997) | Hear me out before you start shunning my list all together, but this movie was the only logical choice for the number 10 entry. Throughout all of it's shortcomings as a film, this is in fact still considerably better than Superman III, IV and Superman Returns. I would much rather sit through this movie than those three any single day of the week. Although I would rather not watch this movie, it isn't that bad from the stand point that I can at least make fun of it while watching. Something I can't say for the other films listed in this opening spot. 9. Batman Begins (2005) | I know people who love this movie, but I've never been too particularity fond of it. I mean it's not a bad movie at all but for me it isn't one of the best batman movies. It set the tone for the two eventual sequels that set the standard for comic book and movies in general. Even though my boy Liam Neeson is in this film, (whitewashing alert), it was still meh at most to me. I think for me it's more so my lukewarm response on the main villains, (I could careless about the Scarecrow). But still this was an Ok movie in an otherwise brilliant franchise. 8. Superman (1978) | Finally we have our first Superman movie, and it's the 1978 film. Hailed as one of the best comic book movies of all time, Superman was indeed one of the few comic adaptations that got it right. It definitely pulled out all of the stops when they got to Marlon Brando to play Superman's father Jor-El. Of course there's a slew of others in this film, but I won't ruin it for those who haven't seen it. Out of all of the comic book movies out today, it's still one of the best starter films to a franchise. 7. Batman Returns (1992) | One of the best film adaptations ever, Batman Returns set the bar in terms of a comic book movie being it's own special entity. With outstanding performances from Danny DeVito and Michelle Pfeiffer as Penguin and Catwoman respectfully. This film not only showed that comic book characters had range, but if given the chance they show that they can actually be memorable and set apart from the conventional movie character that's usually seen on the big screen. 6. Batman (1989) | Jack Nicholson stole this movie plain and simple. His depiction of the Joker sealed the deal on this movie and offered a lot of different range. Some argue that he was featured too much in this movie and that the director focused on him rather than Batman. I'm completely fine by that because by this point we know who Batman is really and we know all that he can do. So focusing on the supporting characters was ideal because it makes Batman look that much stronger. One would say that this performance by Jack is the catalyst for another performance on this list. 5. Batman Forever (1995) | I loved this movie for one reason and one reason alone, The Riddler. Jim Carrey's performance was up there as probably the second best depiction of a villain in a superhero movie, ever. His performance was so good that people wanted the addition of the Riddler in Christopher Nolan's saga. I mean Tommy Lee Jones played a superb Harvey Dent and the rest of the cast held their own. But it was Jim's portrayal that has it ranked this high over Jack's Joker. There's only one other performance, to me, that tops Jim's Riddler & two over Jack's Joker. 4. Man of Steel (2013) | Yes, this is the second best Superman movie to ever come out. A lot of people complained about how this movie was made and how much of a dark tone that it had, but that was the best way to go. The days of being cartoonish and family oriented to the T is dead. This movie followed the mold in which The Dark Knight Trilogy went down and capitalized on it's failures. From the opening scene I was all in and I was wanting more at the end of it. This movie did well in setting up the DCCU and getting things rolling for the Batman v. Superman movie coming out. The Casting of Henry Cavill was genius in the sense that he actually looks like what Superman would look like in real life. This role was made for Henry and I'm glad that they gave it to a Brit haha. Granted the fight with General Zod was all out and exciting, it was still nothing on the original fight between the two. 3. Superman II (1980) | Speaking of which is my favorite Superman movie out and probably one of my favorite ones period. There was so much right with this movie that even today's actors attribute it as one of the greater comic book movies that you'll ever see. After a solid introduction film, the series held a lot of promise at this movie. But years later we can only see that it left a high mantle that few can reach up and sit on. 2. The Dark Knight: Rises (2012) | Is in the discussion for second best comic book movie ever, across the board. Building off what the Dark Knight did, The Dark Knight Rises had a great cast, a great plot and a reason for it to be the end. Although they left one major question unaswered, "cough cough* Robin *cough cough*, that needs some answers. With Tom Hardy's Bane, (whitewash alert), this movie is right where it's suppose to be on this list. 1. The Dark Knight (2008) | Arguably one of the greatest movies ever here. From the tone, to the script, the acting by the actors and overall theme of the film, The Dark Knight broke major boundaries upon it's release. I'm still trying to figure out how it didn't earn an Academy Awards Nomination for Best Picture that year, (it should have won). That movie had so many undertones in it that it was crazy. But by far the best thing about that whole entire movie was Heath Ledger's portrayal of the Joker. Bar none one of the best performances that I've ever seen by an actor in my life. If you've ever watched Heath in any of his films, he does a complete 720 and dives right into his role. Early when I said that Batman focused heavily on the Joker's character and it allowed other characters in film to be developed away from the main character, well this is what I was talking about. Although not a lot of camera time is on the Joker, he by far had the most important scenes in the film. Had he not died, there is no telling where Heath Ledger could have taken this franchise, not Christian Bale, but Heath. Everyone in their roles played it to the T; this is by far the best casting in a comic book movie outside of Marvel literally picking all of the right characters. This movie is going to stay at the top of this list forever because it broke so many boundaries and created so many different things that it's going to be hard to do it again. 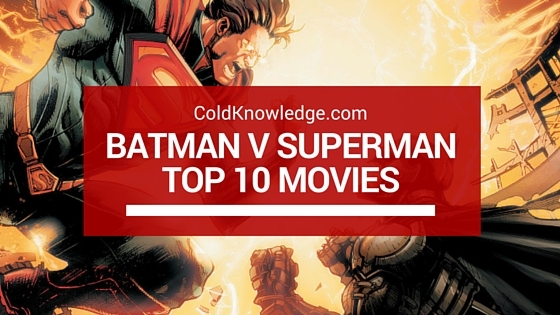 And there you have it, my top films between the Batman and Superman franchises. You think differently or feel one of the movies that I left off of the list should be on it? Then leave a comment below, I'd love to hear from you.